Combine an inch or two of rainfall with a thoroughly saturated ground, and flooding could happen quickly once again across the Garden State. This weekend's rain was just relentless, as band upon band of torrential rain moved through the state. The heaviest rain on Saturday occurred in Middlesex and Mercer counties, in the Princeton-West Windsor-Plainsboro-South Brunswick area. 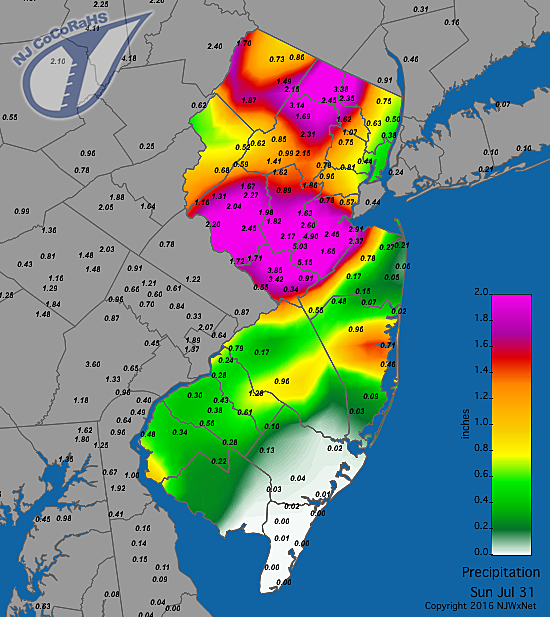 Sunday's flash floods occurred on both sides of the state: Ocean County got slammed in the early morning hours, while Hunterdon County received a soaking later in the day. This really was the worst-case scenario, with widespread 2 to 4 inches and scattered rainfall totals over 6 inches across New Jersey. Berkeley Twp. (Ocean Co.) - 7.62"
Pittstown (Hunterdon Co.) - 6.68"
Mannington Twp. (Salem Co.) - 5.15"
Kingwood (Hunterdon Co.) - 5.04"
Howell (Monmouth Co.) - 4.83"
Ramsey (Bergen Co.) - 4.73"
New Brunswick (Middlesex Co.) - 4.30"
Hawthorne (Passaic Co.) - 4.03"
Red Lion (Burlington Co.) - 3.81"
Greenwich (Cumberland Co.) - 3.75"
The ground is already fully saturated. Rivers, streams, creeks, and canals are now running very high. So it's not going to take much moderate to heavy rain to cause flooding issues to return. The rain that pops up on Monday will be more scattered than this weekend - not everyone will get rain, and it's not going to rain everyone. However, given the plentiful moisture in the atmosphere, pockets of heavy rain are practically a sure bet from any storm that does form. The best chance for these storms will be in the heat and humidity of the afternoon and early evening hours. Rain chances will gradually decline from Monday night into Tuesday, but they don't go away completely until Tuesday afternoon, at the earliest. That's when we'll begin a trend toward clearer, drier weather across the Garden State. Meanwhile, in between the raindrops, skies will range from partly to mostly cloudy on Monday and Tuesday. High temperatures should reach the lower to mid 80s - similar to the weekend. Humidity will remain very high and quite uncomfortable through late-day Tuesday. After the extreme heat and extreme rain of the past few weeks, New Jersey deserves a little break! I'm happy to report that Mother Nature will deliver some beautiful weather for the middle of the week. As high pressure builds in, drier air will lead to sunshine and much more comfortable conditions. Wednesday's high temperatures will be in the lower to mid 80s. Nice! Thursday looks good too, with mostly to partly sunny skies and highs again in the lower to mid 80s. We'll get a bit warmer as the weekend approaches, but a cold front late Friday-early Saturday will limit the heat. Yes, there could still be scattered 90+ degree temperatures on Friday and maybe even Saturday. But it's not going to turn into another extended heat wave. Our only rain chance through late-week will come early Saturday morning.